Do you know that 6 o’clock feeling? Getting out of work, feeling slightly peckish, and in a real mood for a glass of wine? In Spain you get some tapas with your wine, in France a little bowl of olives, in Japan some hijiki seaweed. But British pub culture doesn’t really provide for any of those nibbles that enhance the drinking experience (except if you consider salt and vinegar crisps to compliment any wine or beer). We need to change that! Right now. Get out your baking gear and brace yourself for the star of all drinks appetizers: cheese biscuits! 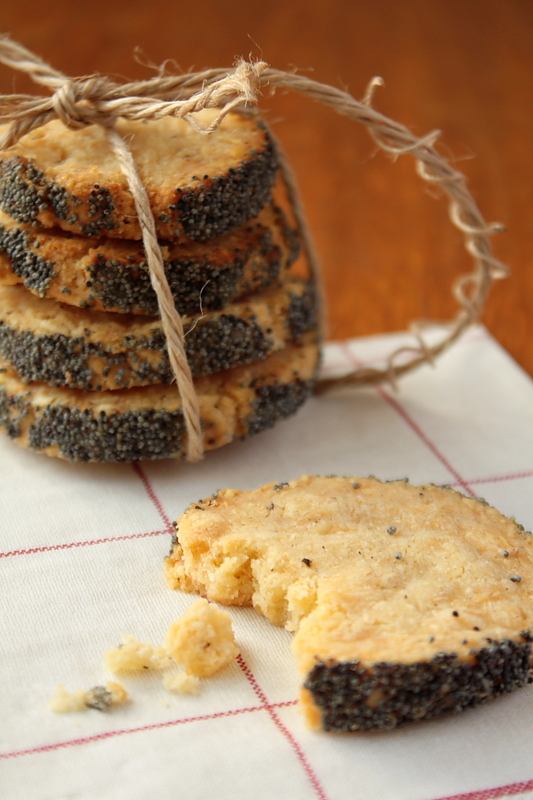 Their crumbly texture quickly transforms into a melt in the mouth sensation, cheese and butter fighting for your attention and little poppies bursting onto the scene as you delicately experience your first bite of these little treats. It came in handy that I won second prize in a blogging competition a few months ago. The challenge was to create a visually creative blog post about cheese, which inspired me to make this cute Tarte au Camembert. The effort was rewarded with second prize, and I got La Fromagerie’s ‘Cheese: The World’s best artisan cheeses’. 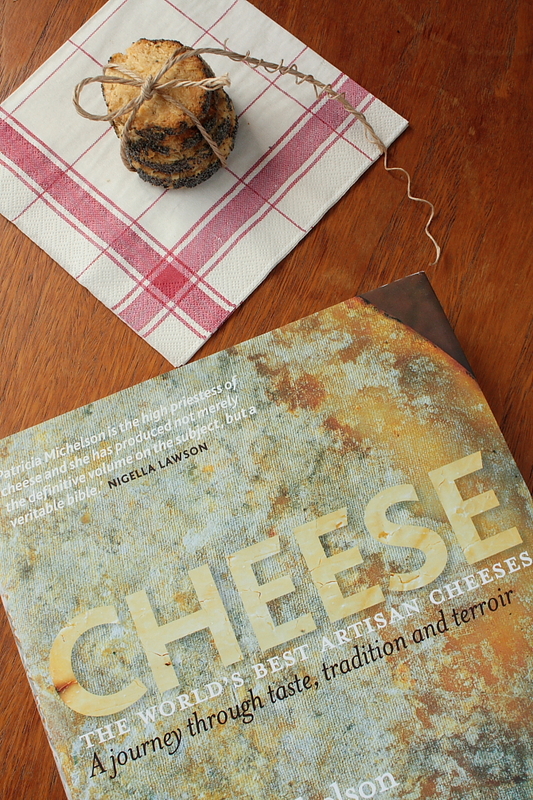 The book is a sort of cheese encyclopedia, with descriptions of cheese regions, the cheeses’ producers, and the cheeses’ taste – all followed by a selection of recipes at the back. That’s where I came across this recipe for cheese biscuits. I’ve made many cheese biscuits in my life, tried numerous recipes and have my favourites, but I thought I’d give this one a shot. 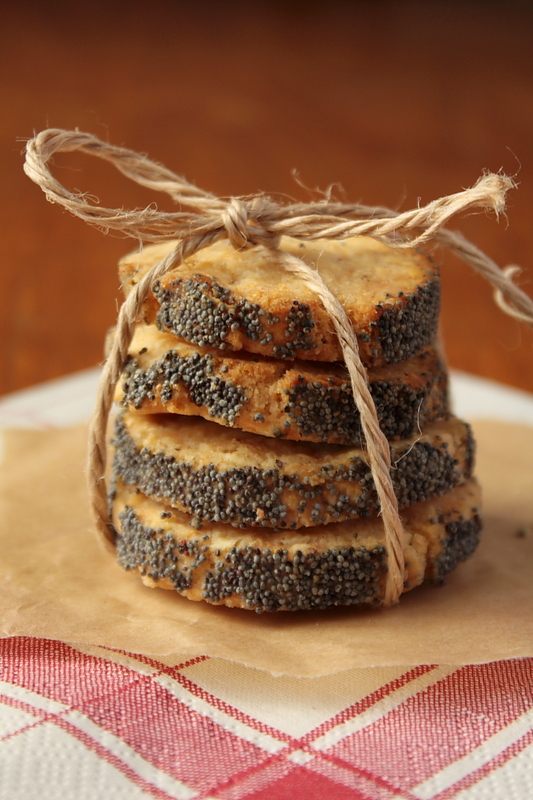 I only slightly changed the recipe by adding poppy seeds in the end. Whilst these taste absolutely great, they’re a real pain to handle. The dough wouldn’t stick together, so I had to add a dash of cold water to somehow make it bind. Then, after I cooled the dough in the fridge for a while and was ready to cut the cookies, everything crumbled again and I ended up having breadcrumbs instead of nicely round cookies… So I shaped them into logs again, and this time chucked them into the freezer, for a more brutal frost therapy! That helped, and after 30 mins the dough was rock hard, perfect to keep its crumbs together, but still soft enough tocut. Victory. Phew! So, instead of sharing this, painful recipe, I’m introducing you to my favourite cheese biscuit recipe instead. Enjoy, they’re so easy to make! Combine the flour, baking powder, salt and pepper in a bowl. In a separate bow, blend the softened butter and the parmesan, add the cheddar. Add the dry ingredients and mix until you get a soft dough. Use your hands to knead into a firm dough that holds together (do this fairly quickly, as you don’t want the dough to become warm). Put the dough onto a well-floured surface, divide into two and roll into two logs. 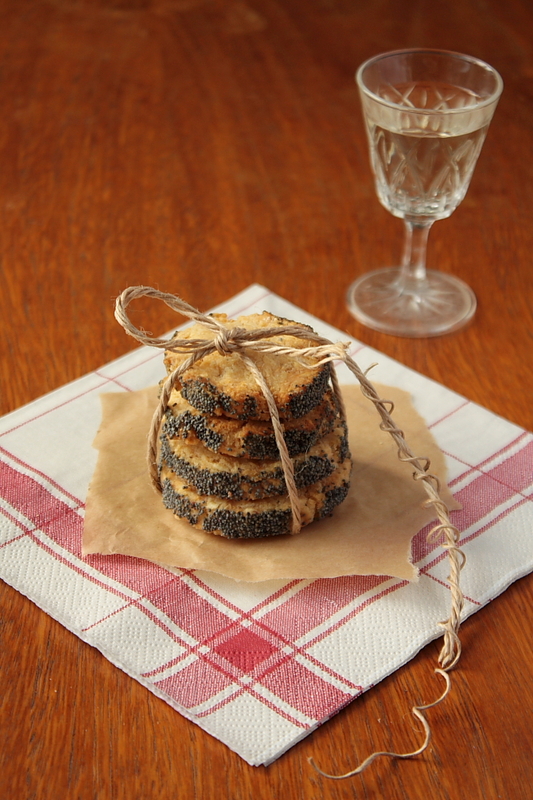 Brush each log with egg white and roll in poppy seeds. Wrap the logs in cling film and put in the freezer for 30 mins. Meanwhile preheat your oven to 180° celsius. Once the dough is hard (but not frozen), take out the logs and cut into slices of about 1/2 centimetre. Put them on a baking tray lined with baking paper and bake for about 15 minutes or until golden. 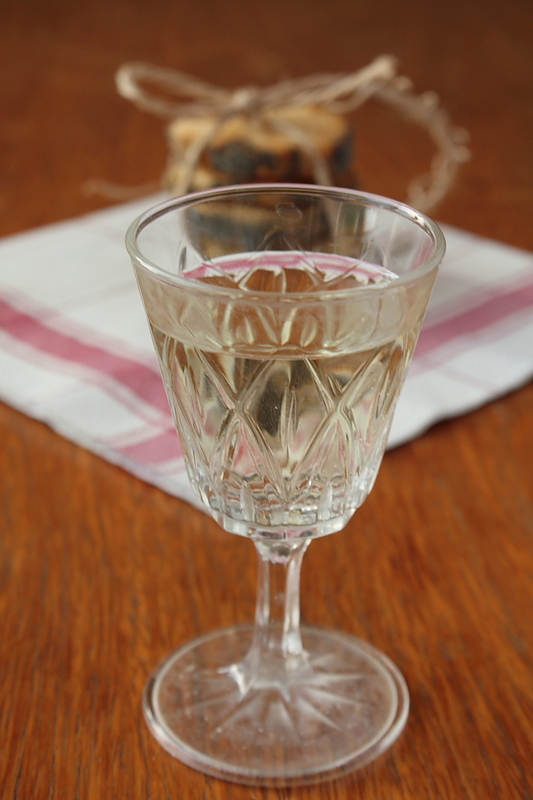 Enjoy with a nice cold glass of white wine. Oh my God, these look divine. I hope they taste as great as they look. love cheese biscuits!!! definitely perfect with wine to wind down after work! Wow those look like a nice quick snack to have on hand with two crazy kids in my house. Now I just need to find the time to make them! There is nothing like a delicious nibble to accompany a nice glass of wine. 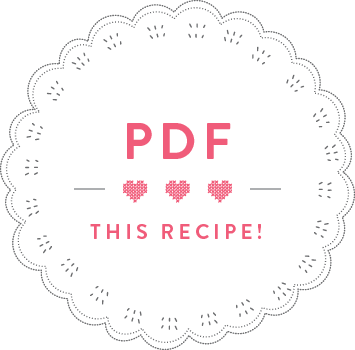 i am already a fan of this recipe – taking notes. I spend my life taking notes of recipes. BTW, what a great book you got in that competition. is 190 in Fahrenheit or Celsius? it’s celsius! Sorry, I’m going to clarify that from now on and change it right away. Thanks for pointing it out! how come i never got to try any?? Glad to hear you liked them Sue! These are gorgeous! I made them for an after work office do and they went down a treat. They’re now a staple in my repertoire. Hey Janet, use plain flour, otherwise they will rise way too much. Have a nice festive season! Can you freeze the baked biscuits? best is to freeze the unbaked dough and then bake them freshly on the day. If you won´t have time then yes, you can freeze the biscuits, defrost them and heat them up in the oven until crispy and warmed through.